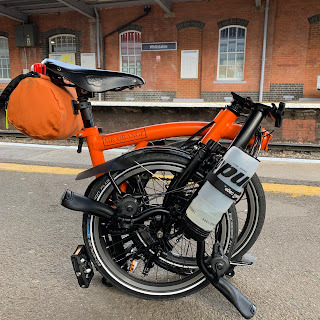 My Orange Brompton: Waterproof Jackets! My Altura Night Vision jacket which has served me well this year has finally given up the ghost and I am in the market for a replacement. Unfortunately after being out in several downpours there seems to be weak areas in the arms and shoulders which has allowed water to come through. I have attempted to reproof it but this has not worked. In many ways I actually think that putting these types of jackets into the wash seems to render them useless. (This is certainly the case with activity jackets I own). What jacket to get next is a bit of a minefield as the range and price of cycling jackets is vast. It seems each manufacturer makes sometimes wild claims about a jackets waterproof and breathability qualities.The reality can of course be very different in real world use. Added in to the general, "what should I get next?" is the superficial business of colour. Ideally it has to be orange! Price is also a big factor as in two years of serious cycling I have got through two jackets. For me at least they seem to last a season. I therefore do not wish to pay a fortune for one. If anyone out there has any suggestions please feel free to leave a comment. I am sure at this time of year many of us cyclists start to think about waterproof jackets. So if you have a good one - or a bad one for that matter - let us know as your knowledge will possibly help us make an informed decision. Endura Helium or Altura Vapour. Also use Brompton bag as backpacks seem to wear jackets out quicker..especially on shoulders..
Helly Hansen. Best (and driest) jacket I've ever owned.I particularly like the zippered vents under the arms. Easy one - get yourself over to the Paramo store in Covent Garden - they will sort you out. Fantastic gear, British Company, no membrane (nothing to go wrong), warranted for life, exceptional breathability (useful for cyclists!) - just an occasional machine wash.
Read the reviews. Just like other Paramo users - I am completly evangelical about their products - nothing else comes close.